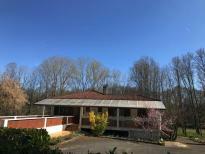 Property for sale in SW France. Aquitaine and Poitou-Charentes. 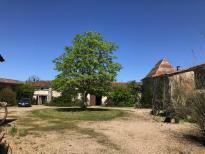 Property listings, cottages, houses, villas, barns, campsites, hotels, B&Bs, Gites, restaurants, mills, building land all for sale in Aquitaine and Poitou-Charentes. Full descriptions of each property. This superb area of South West France includes the regions of Aquitaine and Poitou-Charentes which together incorporate the departments of Dordogne, Gironde, Landes, Lot-et-Garonne and Pyrénées-Atlantiques, based around the Prefecture of Bordeaux, and Charente, Charente-Maritime, Deux-Sèvres and Vienne, centered on Poitiers. There are regional airports in Poitiers and La Rochelle, Bordeaux, Toulouse and Bergerac with regular flights from Britain and Europe and regular ferries to La Rochelle from the British Isles. Both areas are well-connected by road and train services. 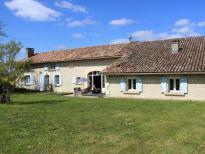 Beautiful character house with cottage, pool and views, near Chalais, in Charente 16. Detached 5 bedroom house by the river, near Montguyon, in Charente Maritime 17. Detached house with 5 bedrooms, beautiful garden and lake, near La Clotte, in Charente Maritime 17. 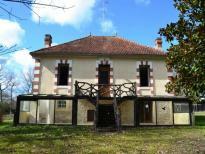 Detached house with land, lakes and no close neighbours, near Chantillac,Chevanceaux, in Charente 16. 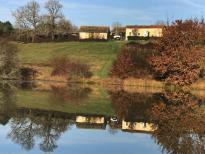 Farmhouse with large lake and 12ha of land, fishing paradise , near Montpon, in Dordogne 24. 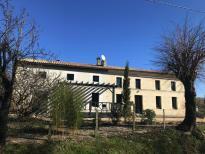 A wonderful gites complex with swimming pool, near Barbezieux,Brossac, in Charente 16. 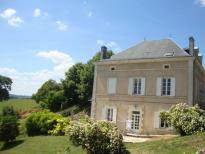 Impressive house which stands proud in the countryside, near Chalais, in Charente 16. 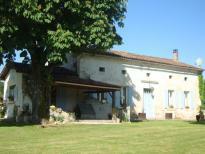 Manor house with gites set on 15ha, near Brossac, in Charente 16. Poitou-Charentes generally has the most sunshine hours a year in France outside of the Mediterranean. The summers are generally quite long, warm and sunny, though you can expect a few rainy days too, while the autumns are usually clear and bright. The winters can get cold the further inland you go, but they don’t last long, and you can often expect a warm spell in March or even February. A region well known for the food and wine, it ’s not only home to cognac, but also the aperitif pineau and some excellent local wine. The Charente Maritime has miles of long sandy beaches. The region is equally and rightly noted for its great local delicacies too – for example cheese, honey, poultry, butter and snails – as well as fine restaurants, hotels, cafes and bars. Then there is the sheer variety of things to do and see in the Poitou-Charentes, such as leisure parks, golf and beautiful towns and villages. It’s divided into four departments – the Charente, Charente-Maritime, Deux-Sèvres and the Vienne – and each has its own charms, character and tourist attractions. Aquitaine of course includes the fabulous wine-growing area of Bordeaux and some of the most spectacular scenery in France, but the regular visitor will enthuse about the clement climate and the 2,200 hours of sunshine each year, the atlantic coastline and the endless beaches, mountains, nature reserves, historical heritage with fortified towns and castles, the Belle Epoque elegance of the seaside resorts, the 18th century grandeur of Bordeaux, the paleolithic splendour of Lascaux and the ample evidence of the Roman and English eras. Did we mention the food? The fantastic local cooking, the locally-grown fresh produce, the traditional and the new, and all reasonably-priced. "Aquitaine - you won't want to leave" is a slogan of the local tourist promotion board, and it is true that many people fall in love with the area and start looking for somewhere to stay on holidays, to rent or to buy, or somewhere to live full time, perhaps also with the prospect of a profitable property investment to manage and produce a small income. Whatever your needs, Wright French Properties has the local knowledge of what's available, the ins and outs of the French property system for buying and selling property, how to mitigate local taxation and where to go to for professional advice, in English if required, and a canny idea of the traps and pitfalls that await the unwary buyer. This site lists properties of all sizes and conditions, from run-down ruins that will provide scope for dedicated renovators to fully express their building skills, to the recently-refurbished 25-room chateau and 50 hectares of land for someone who justs wants to move in to something grand. Something for every pocket and purpose.